Fellow Historical Society members met for a casual evening of conversation and camaraderie at Lumberjacks Patio and Grill. Located at 1000 River Road, just north of Felton Street in North Tonawanda, this riverfront restaurant sits right on the water so you can enjoy the cool breezes off the river, marvel at the natural beauty of the area, and watch the sun begin to set - all from the comfort of a spacious patio. The highlight of the evening was the unveiling of nine full-color historical panels that are scheduled to be installed along the bike paths in North Tonawanda in June. 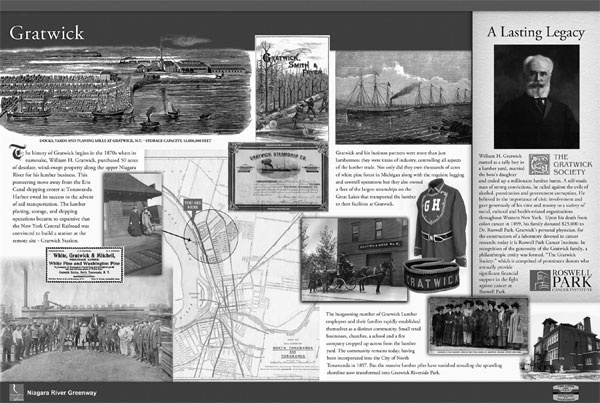 Each 2’x3’ sign is a fascinating collage of artifacts, photographs, maps, and ephemera, depicting the industries, individuals, buildings and events that shaped the emerging community of North Tonawanda. Special guests included members of the Niagara River Greenway Commission who shared their current plans for Greenway development. 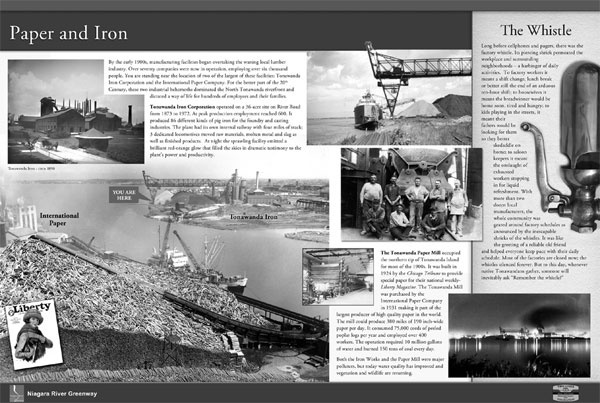 Illustrated here are two of the new historical panels scheduled for installation along the bike paths in North Tonawanda this June. The panels featuring Gratwick and Paper and Iron will be joined by Boat Manufacturers, Canalside Commerce, Lumber City, Remington, Webster Street, Heroes from our Past, and the Niagara River. This project, which has already seen the installation of similar historic panels in the City of Tonawanda, is sponsored by the Historical Society of the Tonawandas in cooperation with the cities of Tonawanda and North Tonawanda and funded by a grant from the Niagara River Greenway Commission. The panels were designed and written by Ned Schimminger and Alice Roth, using materials from the collections of the Historical Society, and produced and installed by ASI Signage Innovations of Grand Island, NY.